My last meeting of day on Monday, here at GDC 2012, turned out to be a real treat. Alex Houdent of GlobZ, a studio formed in 2000 that develops primarily Flash-based games, let me spend some time with his upcoming iPhone arcade puzzler Twin Spin. 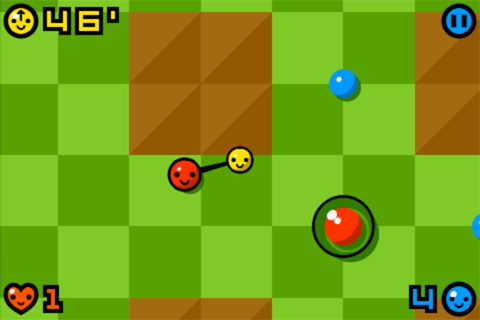 In Twin Spin, you control two little smiley blobs (one red, one yellow) connected on a line. Your goal is to move your pair of blobs around the checkered playfield, bumping target balloons, stepping on target spots, negotiating platforms that slide and spin, skidding on ice, dodging spike balls, and contending with various other trials and tribulations. The real trick of the game, however, is moving your smiling duo around. While one blob is firmly planted on the ground, the other orbits about it. A single tap swaps things out, and the other blob takes to orbiting. In this fashion, you can move (stagger, really) about the play area — or try; it’s a pretty tricky thing to get a handle on. Twin Spin sounds simple, and looks it, too, but trying to time things perfectly and negotiate the hazards to get across the board to pop the right balloons (some of them are color-coded to require a whack from a particular one of your twins) gets madding, and fast. The one-tap control mechanic, requiring precise timing and a fast reflex to keep out of trouble, makes for a unique and fun game experience I’ve not encountered before, and one that works perfectly for short, one-handed play sessions on the go. I think I played through 20 levels of Twin Spin before I let Alex get on with his presentation. There’s definitely goodness on the way, here. Twin Spin for the iPhone has been submitted to Apple and should be landing shortly. An iPad version (or a universal update) will follow. UPDATE: Twin Spin has landed in the App Store [link], priced at $0.99.